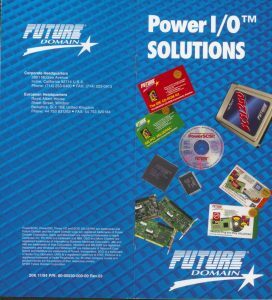 In the early years of Future Domain marketing efforts were aimed at OEM customers, who required very little “sizzle”. They based their decisions on the specifications of the products, face to face meetings with sales and engineering personnel, company financial strength and quality control. 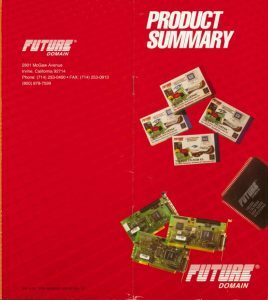 We began selling into the Distribution market first to address smaller OEM’s, but by 1989 organizations called “resellers” and “system integrators” began to take on a large part of the PC marketplace sales. About this time the large OEM’s had turned away from SCSI disks and concentrated on IDE, so this reseller and system integrator market became more important. These customers wanted and responded to the sizzle. The marketing employees I had hired to that point were primarily OEM oriented. 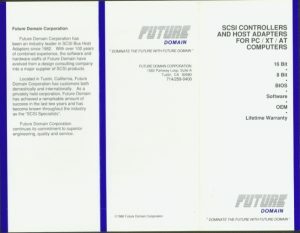 After COMDEX 1989 it became clear to me that we had to add a new dimension to our marketing effort. I knew how to sell OEM’s, but I did not have a clue as to what would be attractive to a consumer. Luckily, my wife Patty did. I decided to have Marketing report to her, and asked her to restructure the marketing department to add the capability to wow this new class of customer. I asked her to accomplish this by COMDEX 1990. I also asked her to maintain the OEM focus for me. Patty got right to work, and within a few months had hired a team and found outside contractors to give our product literature and packaging a complete makeover. I thought it was fantastic, but Patty was not satisfied. After getting customer feedback at COMDEX, she set her sights on a complete makeover by COMDEX 1991. By that time our product offering had improved significantly, so she had more to work with. The heyday of retail marketing was from 1992 on. By then we had a very strong product line and good focus. We had hired Madonna Saxton as VP of Distribution Sales and she had a lot of experience with companies that marketed to the reseller. She and Patty began to work closely on marketing materials and trade show presentation. Our COMDEX presentations became larger and more ambitious as each year passed. By 1993 Patty was doing stage presentations with professional actors introducing our new products. In addition we had “classroom” space at our booths that allow our sales engineers to do on-site training for resellers. As a result of these marketing efforts and Madonna Saxton’s management of the Distribution channel, our distribution sales increased to almost half our sales at one point. Our success with IBM and other OEMs eventually kicked in and reduced the percentage of our sales attributed to distribution, but the absolute dollar value continued to increase strongly and these sales were our most profitable. Mike Shaw had brought on Arrow Electronics but failed to expand our distribution channels. Madonna recognized the need for Distributions that focused on Resellers, and she signed the largest and most successful like Tech Data and Ingram Micro, the world’s largest distributor. Having the proper marketing material was key to this effort. As a result of the reseller efforts our OEM marketing materials also improved. This enhanced our company image with large OEM customers and forced our competitors to respond. Marketing was a key element in the success we had after 1991.